As I was walking back from the bank, I came across these two children and their dad and I asked if I could take a picture. You could see the pride in the father’s eye as I paid attention to his children. Later I watched them drive away. The little girl sitting behind her dad holding on to his jacket. Everyone needs a job and salt. 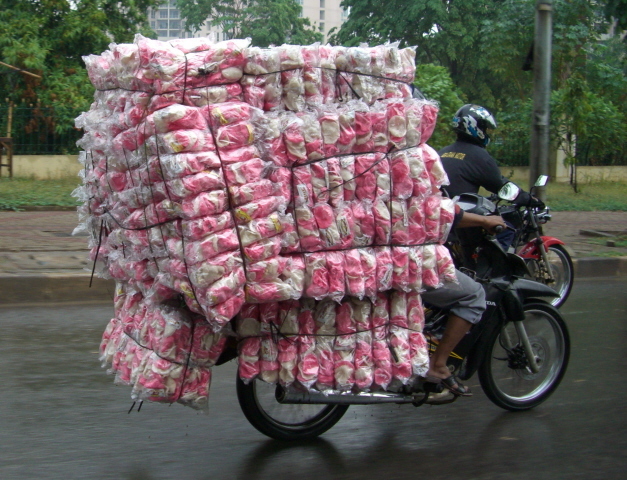 This man is seen delivering and selling it in a traditional market. When you stop for gas, there are people who are allowed to try and sell you their goods. This man is selling crepes, but with little success. This is a fruit snack salesman. 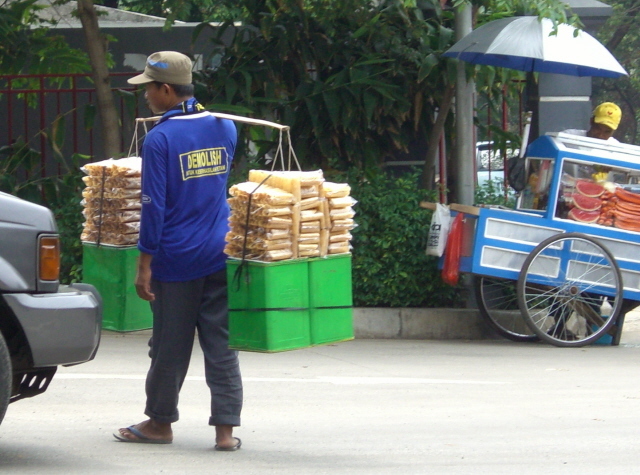 There are many of them on the streets but this man’s cart is either new or he really takes care of it. We would not dare eat from a cart like this. This is the elder’s choir that sang in Zone Conference. From left to right – Elders Louhannapessy, Rowberry, Teng, unknown, Roper, Cowan. They did a good job and Mary played for them. This entry was posted in Mission - Indonesia on October 30, 2007 by Bill. I got up and went to the gym before anyone else was up. By the time I got back Mary was up and dressed. I quickly showed and dressed before the Kanes got moving. We read from the Kitab Mormon for a short time before Mary had breakfast with the Kanes. Earlier I had my usual orange juice and banana breakfast. We got a nice letter from McKay and I answered it. She seems to be quite busy at school. She is in a choir and is going out for a play. I wrote her an answer. We head off for the zone conference and when we get there I figure out I left the office keys back at the apartment so Sam and I have to go back. He does a great job of getting us there and back just before 8:30. When I get into the office something smells wrong but I am a little late in getting up to the meeting that – I found out later – was supposed to start with a half hour of meditation to get spiritually prepared for the conference. Without knowing it, that is what I do by reading from PMG – some of the time in Indonesian. Mary played for the conference including a half hour of prelude music. Elder Hallstrom asked all the missionaries to come up and shake hands. To the young missionaries he gave a piece of counsel. President and sister Marchant also greeted us. As I shook hands with them, I received more testimony that they were called of God to lead this mission at this time. The five hours of meetings went rather fast. I enjoyed the lessons taught by Elder Hallstrom and wrote lots of notes in my ledger. I was very impressed with sister Hallstrom’s talks – she gave one in the first half and one in the second. In both of them she used the scriptures to make her point. Now many speakers read the scriptures when giving a talk but she wove the scriptures into hers like a true artist would weave material. She used Jeremiah 20:7-9 and Alma 48:7-9 for her second talk. My favorite thought from her was “Do you have fire in your bones” for your mission. Elder Hallstrom did more training than teaching. I got two great quotes from him that take a lot of thought. “Are we messengers worthy of our message.” “We mistake activity in the church as being the same as activity in the gospel.” When he spoke about ‘vain repetitions.” He pointed out that this does not mean we can not ask the same thing in each of our prayers if we are sincere. What makes repetitions vain is that they are just words without any real meaning. The real high point for me was near the end when some of the missionaries went up and bore their testimony. Elder Hallstrom said that he was in a meeting where 12 prophets and seers gave their testimonies in a total of 12 minutes. So the testimonies that were given were short and powerful. Elder Whitmore started it and it just kept going – about 2/3 of them touched me deeply. What power there is in personal testimonies – especially those of serving missionaries. I was sorry to have them stopped so Elder Hallstrom could share his testimony. While the conference was going on some other interesting things were happening that had impact on Mary and I. The main one was that there seems to have been a power surge in the building that fried a number of our pieces of equipment. We lost our last printer, one computer and a monitor. Luckily for us it seems that happened was that anything that was on with a power supply or a converter was zapped. So all that we should need is to replace the converters on printer and the monitor and they will be OK. Hopefully when they replace the power supply in the computer it also will work fine. Personally all I really care about is that we do not lose all the info on the hard drive. We have not backed it up – something we will do very quickly. But until they are fixed we have only one computer and no printer at our office. Surprisingly after the first shock, I did not become excited about the problem. I guess I am learning a little more about patience. I guess it helped that the conference was on and I really had to attend so I left it to Ari to get the damaged piece to Hendra at the office. After the conference we came back to the apartment and we have spent the evening finishing the Kitab Mormon – we made it in 100 days which is 20 less than we had set for our goal. The time is not what is important – what is important is that we were able to become closer to the book and also that we continue to improve our ability to read Indonesian. At least the Indonesian used in the Kitab Mormon. I spent much of the rest of the time we had catching up this journal and reviewing my conference notes. I also downloaded, titled, and edited the pictures from the last two days. I will read more from PMG before finally turning off the lights. We had a rather busy morning before leaving for our classes. We had to do laundry so we would have clean sheets for the Kanes. I exercised, we read from the Kitab Mormon and stayed until I could get things hung up. The day of classes went pretty much as usual. Sam and I left after lunch and came back to the apartment to make beds. On the way back to the chapel for some reason I asked Sam about how the water for the student were holding up. He said that they were OK but that we were out of water at the chapel. Since I knew that tomorrow 30 – 40 missionaries were going to be there for Zone Conference, I told him that we needed to get some bottles of water. To make it short, we had three 5 gallon (approx) bottles delivered at about $1 a bottle. I am sure the Lord had me ask that question because there was really no reason that I would normally do that. After the afternoon classes, we went to the apartment and the class headed off to a distant part of Tangerang. We tried to figure how long it would take to get to the mission office. Sam had said that the traffic was bad so we decided that we would not take any chances and left at about 4:15 for a 6 p.m. appointment. Of course we got there in 25 minutes and was left with over an hour to wait. But we had time to talk to some of the staff, to the missionaries, and even to president Marchant. A little later we met Elder Hallstrom from the area presidency for a brief time. Later we went down and helped get things ready for dinner. All the couples in the zone was there along with the Marchants and the Hallstroms. We had a nice dinner with lots of small talk. Near the end Elder Hallstrom told us some facts about the area. It contains over ½ the world’s population and includes three of the four most populated countries in the world. He insured us that when the Lord feels it is time, those countries would be open to the gospel. It was a nice evening. After dinner, the Kanes came home with us. Once again the trip went quickly so we had some time to sit around and talk. Sister Kane needed to iron her skirt and we had to tell her we did not have one because we gave it to our sister students for their clothes. She really needed an iron so I suggested the two ladies go to some of our neighbors and ask for one. A short time later they came back and were laughing so hard we were afraid they would have an embarrassing accident. They were laughing because they had gone to an apartment and was greeted by a nice Australian man who said that they could borrow his iron. He left them at the door and went to get it. Soon they heard this very loud pounding on a door. It kept on for over a minute. The ladies thought he was trying to get his maid’s attention so she would open the door to her room. Finally he came with the iron and explained that he thought he had locked himself outside the back door and was trying to get their attention to let him back in. When sister Kane asked how he got back in she thought he said he ‘prayed’ and Mary thought it was ‘pried.’ They decide that it could have been either – they could not figure out his accent. For some reason they thought all of this was terribly funny and hardly could keep straight faces until they got out of his sight and hearing. They then just exploded. Neither elder Kane nor myself thought it was all that funny so I guess you had to be there to really appreciate it. We finished the day by reading a little in the Kitab Mormon – we only have 6 pages left – before going to bed. It was a good day as we were able to help our students and share dinner with our good friends the Kanes, the Walkers, and the Davies – as well as the Marchants and the Hallstroms. The sharing of a mission is something that makes bonds that are special. Not only with the couples but also with the younger missionaries. We went to the English branch for church. It is only the 4th or 5th time that we have attended there. We feel we have to have a special reason to not go to one of our branches. Today’s reason was that four of our English students would be speaking. We got there early enough to stand in the line of missionaries and greet people. Some we knew some we did not. Brother Willis asked to home teach a sister who lives in Puri Casablanca. Later he introduced us and she will call us when we can come. The students did great with their talks. None of them read their talks. They had notes but they only had to refer to them a few times. Puji was able to speak clearly and told her story about teaching a woman who was deaf and dumb. She could not talk to the missionaries and they did not talk to her. But Puji said that they understood each other and the woman was baptized a month ago. Puji said that there were still miracles being done. Daisy changed her talk a little by telling the story of her mother’s last months. She could not hear very well and she could not walk. Daisy would go to church and then come home and speak right into her mother’s ear to tell her about the talks and the lessons. It was a truly touching story. The guys also did well but I did not feel the same spirit that I felt with the two young ladies. It was amazing to hear them speak before a whole audience of English speakers and be able to do it so well. We are truly blessed to be able to teach such fine young people. As the sacrament was being passed I read about the crucifixion of our Lord. As I read in Matthew I noticed 27:36 that reads after the guards had cast lots for his clothing,“And sitting down they watched him there.” )I must have read it a dozen times or more, but I do not remember ever noticing it.) It then says that they put the sign “King of the Jews” on the cross. None of the other gospels has the line about them sitting down and watching Jesus as he died. I do not know even now why this struck me as of any importance. I tried to join those guards as they sat there – probably as they always did – bored with their job. Hoping that those three men on crosses would die quickly so they could get them down and then go home for a nice dinner. Maybe they bet about which of the prisoners would die first. But maybe one of them felt something special, maybe one of them had a life changing experience as he witnessed that scene. “And sitting down, they watched him there.” Front row seats to the most important death that will ever happen. Sister Moore gave a very meaningful lesson on the importance of our bodies and the need to develop Christ like attributes. She challenged us to choose one from a long list of attributes of members of the Lord’s church that we gleaned from the scriptures and work on it. She also had the whole class introduce themselves and for us to try and remember the name of one of the people who we did not already know. I remember Bob Willey – a member from Lindon who comes here to look in on a project and then flies back to Utah. I had a special experience between Sunday School and PH – and it happened in the restroom. I found myself next to a brother and introduced myself. I found that he was not a member of the branch – he lives in Shanghai – and was only visiting for the day. He works for a German company that has a factory in Bekasi. I told him the I was here to work with employment and suggested that he might be able to get us an introduction with the HRD of their factory. So we exchanged cards and hopefully he will be able to get us an appointment. It is another one of those coincidences that I think the Lord arranged. Brother Peterson was only here for one Sunday and it was the one Sunday that we would be at the English branch for months. Then we are put together in a situation where it was natural to introduce myself. Add that he works for a company with a factory in an area where we need jobs and I see it as a tender mercy from the Lord. Priesthood was fun and informative. We talked about women in the church and our relationship with them. We talked about wives and mothers. Brother Orton told how when he was in a bishopric, his wife had to do everything to get the children ready and bring them to church. Later he was released and his wife became Stake RS president. The roles reversed because she was almost always away visiting other wards. He had to learn to do his daughters hair – an experience she still talks about and uses in lessons – in a positive way. When we were singing the closing song, elder Roper rebelled when they tried to sing only the first and last verse of the song. He said, no and proceeded to start the second verse in such a loud voice that everyone soon joined him. Elder Roper is truly one of a kind. It was strange to get back to the apartment before noon. Since then we have had lunch, took naps – Mary got in two – worked on more inference practices, read 6 pages from the Kitab Mormon – we are in Moroni and that goes rapidly – and caught up this journal. We ordered in Pizza for dinner – this was the first night we could do that this weekend. We got a call from Elder Kane saying that the Harris Hotel was full. I told them that they were welcome to stay with us. Sister Kane insisted that she would sleep on the couch or they would not come. I told her OK. But later when we started thinking about it, it is a lot easier for us if they take our bedroom and we sleep elsewhere. So I called her back and asked her to please let me sleep on the couch because it really was easier. She did not believe me so I had Mary talk to her and that convinced her. She finally agreed. It is going to be a long day for me. I woke up at 3:30 and never really got back to sleep. I finally gave up at about 4:45 and started studying PMG in Indonesian. Time goes by quickly when I do that and it was soon time to head down to the gym. After exercising, showering, and breakfast we read a couple of pages from the Kitab Mormon. We are almost to the end of Ether. I also spent some time working on the Inference exercises for class. We are hoping these simpler exercises will allow them to be more successful and gain confidence for when they have harder stories. I listened again to the students sacrament meeting talks. We got to use the chapel and the sound system so they are getting use to being up there. I am somewhat worried that a couple of them might ramble a little and they are hard to understand at times, but they will do great. We are going to the English branch so we can hear them speak. Mary gave them a test for the rest of the morning class. While that was going on, Sam and I made a quick trip to SoGo to get me some orange juice and a few other things. Earlier Mary had pointed out that today is the 50th anniversary of my baptism – my 50th birthday into the church. In Indonesia the person who is celebrating their birthday provides the party. So I bought bananas and some fresh sugar buns for everyone and we had a little party at lunch time. When the afternoon class started I worked with them using the first ones I made and they did pretty good. I did find that I needed to improve some of the statements to be less ambivalent. (*That is a good vocabulary word..) We than split the class for the remainder of the period. Mary was scheduled to play for choir practice so she stayed to teach the evening class and I came home to do laundry, wash dishes and get her some dinner. I ordered her a nice dinner from our in house restaurant and Sam took it back with him. I must confess that although I did the chores and worked on more Inference practices, I also fell asleep for about an hour. Waking at 3:30 finally caught up with me. Mary made it home soon after 9:00. I expected her to be exhausted but she was in good spirits. She is an amazing lady. Anyone who has put up with me for all these years has had to be. My memory has never been great and I have only kept journals on and off. Therefore there has been a lot of things happen over the last 50 years that I can not recall. But I do know that being baptized into the Lord’s church is one of the defining moments of my life. What a blessing it has been to be in the Kingdom for these last five decades. To have the opportunities I have had to serve in so many callings. To have had so many wonderful bishops and stake presidents. To have been able to teach and be taught. To be able to serve a number of times as a missionary – stake and full time. To meet and come close to so many people who have touched my life for good. And hopefully touching others lives for good. 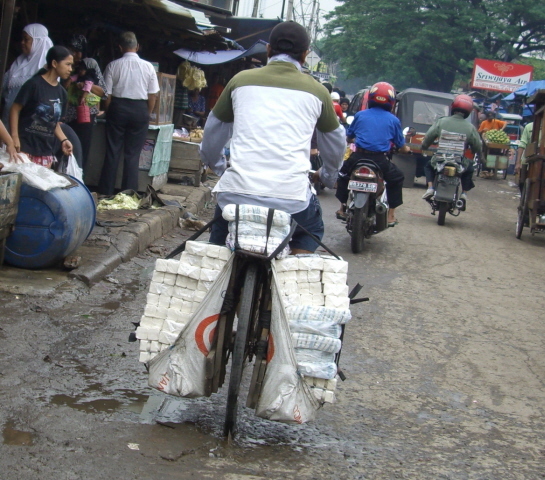 This entry was posted in Mission - Indonesia on October 28, 2007 by Bill. I slept in and did not go to the gym. Instead I studied Indonesian by reading from PMG. I am not sure how effective this is but it does combine two important areas of study. We read from the Kitab Mormon in Ether where Moroni is expounding on faith in things not seen. Yesterday when I was talking to Elder Subandriyo, he mentioned that sometimes as leaders we have to make decisions based on faith because we can not know for sure what needs to be done. We have to take a few steps into the darkness having faith that we will come out into the light. Sometimes I am sure we hold back our progression because we want everything to be perfect before we do something. I think many couples – including us – deny themselves blessing because they do not go on their missions until all their worldly ducks are in a row. I know now that Mary and I missed at least 5 years of blessing by not going on a mission earlier. Hopefully our mistake will help our children make the choice earlier. I started the morning session of the IEC by listening to all of the talks again. They did not seem as good this time. The biggest change came from Rudi who’s talk lacked any feeling. I asked him about this and he said he tried to write more of his talk down instead of just having notes. I told him that he should go back to the old way and trust the Lord will help him. Hopefully they will all do well on Sunday. What a big challenge this is for them and as far as I can tell they are all from their own experiences and not borrowed from the Ensign or PMG. I had an interesting experience during the time we had broken into two groups. Some how we got into talking about the difference in the ABCs of the two languages and when they said how they did C and gave a soft sound, I made the comment that I was surprised that it did not have the ‘ch’ sound like it always has in actual speech. I then asked them if it was ever used that way. It turned out that it always sounds that way and never ‘ch’ as we were taught. It is not a ‘See” or a “Kah” but something completely different that produces no explosion of air. I asked if any of their bulai companions had ever said their ‘C’s’ correctly. They all shook their head no, and Rudi said it did not matter. They could understand them. I guess I need to back off on ‘th’ because I can understand them. But I won’t. After eating lunch and doing some work in the office – Sam is making our contact calls – we had Sam bring us home. We both took naps and read from the Kitab Mormon before catching a cab back to the chapel. We took all the students out to dinner at KFC. They would really rather have Padang but they ate the KFC. We walked over and while we were in there the rain came back. Sam rented an umbrella and got the car so we would not get soaked. After we loaded them up with homework, we bid them goodbye and came home. I spent the rest of the night making up inferences exercises, reading from the Kitab Mormon – we are down to about 20 pages – and studying Indonesian. I feel that studying from PMG is helping me greatly. I studied it until I turned off the lights. Just a note about the rainy season that is now upon us. It seems that once or twice a day a huge thunderstorm moves through. Often it dries up – except for the deepest puddles – very quickly and then the next storm moves through. The main problem this brings is the traffic gets snarled even more than usual. When it is really coming down, the motorcycles pull under overpasses and block one or more lanes of what is usually already a bottle-neck. Add the confusion of large puddles and nervous drivers and you get a major parking lot scene. 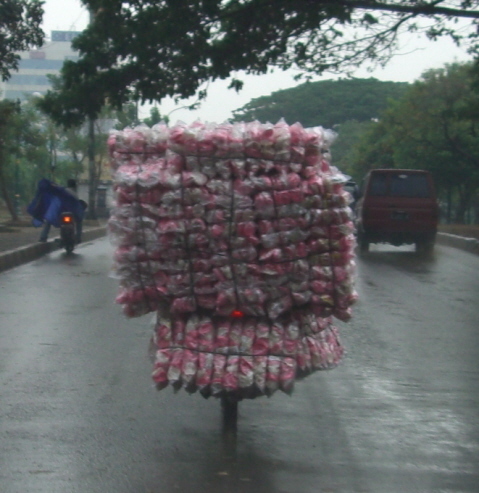 This entry was posted in Mission - Indonesia on October 26, 2007 by Bill. This is a huge load of rice cake crepes. Although we have seen loads like this before, this is the best picture that I took. Sam and I were so concentrated on getting it that we almost missed the turn into the apartment complex. I took the picture of the dentist sign for Shauna. Real dentist signs are rather dull while the ones for those who make false teeth are often very artistic. The month is flying by so quickly. Slept well and woke in time to go down and exercise. I am able to jog a little further each day. A very normal morning until about 8:00 when Sam called to say there was a problem. It seems that the door to the girl’s apartment jammed and Puji was stuck inside. They called Sam and he called the man who does repairs for the church. He could not get it open and he wants to break down the door but need the permission of the landlord who does not come until 9:00. Sam is going to try and get Puji out through the window. Since there was nothing we could do about this, we went back to reading from the Kitab Mormon. Sam is truly one of our great blessings. While Sam was getting Puji out of their apartment, we took a taxi to the office. The class started about 15 minutes late. But that and Sam cutting himself on the window he broke was the only result of the problem of the jammed door. While Mary worked with the class, I went up to the chapel and listened to all of the talks that they are preparing for Sunday. It was a very special time for me. Those who had the best English all gave good to fine talks and one of them was very spiritual besides being well presented. But the surprises of the day was Puji and Femmy’s talks. Puji has to struggle with the language and Femmy is only 18 years old and has not been on a mission. But each of their talks were from the heart and spirit. It is a shame that all of them can not give their talks. I will listen to them again tomorrow and if the impression holds up I will probably ask brother Miller to change who speaks. Since it their and our P-day we only had a morning class. Mary took the first two hours – I got to make lots of copies and write more vocabulary reviews. All of this takes more time than might be thought. Especially the reviews. I took the last hour and worked on vocabulary – they have a long ways to go yet but it is coming. After class we worked our way to the mission office. We had lunch before Mary taught her class. While she taught I got to talk to Elder Subandriyo – he says that the PEF approval has gone to the President Hinckley for final approval. He told how he finally just told Hong Kong that they should stop worrying about getting the wording of the agreement with the bank exactly right and let it be approved. We can work out any problems when they come up. Elder Subandriyo is a very wise and spiritual man – but like most great men in the church he is also very practical. Hopefully we will be able to start the first applications in November- after we have trained Sister Endang and the PH leaders in Central Java. I also had a chance to share some of my thoughts with the office elders. They were discussing the comment by one of the elders that he did not think he ever had felt real joy or sorrow. I told them that I have found that real joy and sorrow are only found in the church and the family. That while we may be sad and happy with and for others, that real Joy and Sorrow are connected with things that are Eternal. One of the things we really look forward to each week is the arrival of the latest Church News. Today’s had an article about a symposium on Wilford Woodruff and our friend Tom Alexander was one of the speakers. He wrote an excellent biography of WW so it only make sense that he got to speak. I thought his subject was very interesting and I look forward to reading the whole talk when we get home. When Mary was finished with her class we went over to Grand Lucky and bought lots of things that we can not find everywhere. I splurged and spent $10 to buy 10 cans of A&W Diet Root Beer. That is expensive but the only other time I have seen it, the price was $1.50 per can. This sounded almost like a bargain. As we left the parking lot, it started to rain and for the next 15 – 20 minutes it poured. Which meant that streets started to flood and so traffic was slowed down. One good thing about pouring rain is most of the motorcycles riders find places to stay covered until the main downpour is over. We had breakfast for dinner – eggs, hash browns, sausage and orange juice. The only thing disappointing was the sausage that had no real flavor. After dinner we read from the Kitab Mormon – we are still on schedule to finish in 100 days. We are reading the Ether and about all the strife and contentions that lead up to the final destruction of the nation. After reading I spent much of my evening posting pictures and writing in the blog. The internet service was really slow and so it seemed to take forever to get it all done. But I enjoyed writing about the great students in our IEC. Just before turning off the lights, I read more in PMG in Indonesian. 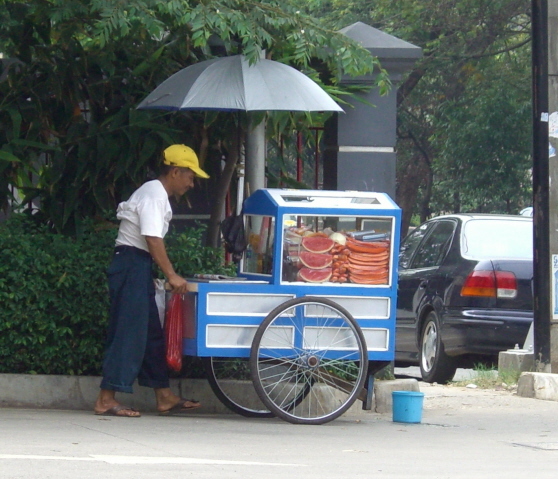 This entry was posted in Mission - Indonesia on October 25, 2007 by Bill. This is our second Intensive English Class. They come from all over Java to Jakarta to spend one month with us learning English. They live as they did while missionaries, spend anywhere from 6 to 9 hours a day reading, writing, and speaking English. They try very hard not to speak their native language and they succeed most of the time. We are truly blessed to have this opportunity to become a part of their lives for this month. We will never forget them and we hope that what we teach them will help them throughout their lives. This is Daisy and she is a recently returned missionary. She lives in Solo but when the class is over, she wants to find a job here in Jakarta. She has good English skills and is a pleasure to teach. Femmy and Wawan sharing something funny. Femmy is 18, lives in Bekasi which is near to Jakarta. She is the only student who is not a returned missionary. I would imagine that the experience of living with two other young women in a single room is something new for her. But she has been a trooper and is always quick to smile. I think she is gaining more and more confidence each day. Wawan is a returned missionary and has two brothers on missions at this time. He lives in Semarang in Central Java and we had met him before while visiting the Bennetts and putting on Career Workshops. He is studying to pass the TOFEL test but we are hoping that he passes the Michigan test that we will have at the end of the class. He is the quiet and serious one of this class, but he is also quick to smile. Ronald is an old friend. We served with him in Tangerang for a number of months before he was transferred. I tried to get him to study English as much as he could while he was on his mission and was happy when he wrote to say he wanted to be part of this class. He is lots of fun but works as hard studying English as he did serving the Lord. He has a very positive attitude and I hope that he will be able to get more education. This is Puji and she comes from a small branch in Magelang in Central Java. She is a returned missionary and was released in the last 4 months. When I mentioned that I might have a position for her here in Jakarta, she thanked me but said she wants to go back to her branch and help build it up. She had less English skills than the other students but she has such a great desire to learn that I think she will gain the most. She has no fear of failing and so she is willing to try to do anything with a big smile on her face. It has been a real pleasure to get to know her as well as teach her. Last but certainly not least is Rudi. He also is a recently released missionary and probably had the best English skills coming in. He wants to go to BYU Hawaii and hopefully we can help make that happen. Rudi had all of his wisdom teeth out the week before he came to class so for the first 10 days he was pretty miserable. About the time his teeth started to heal, he started having bad stomach cramps. But through all of this he has continued to study hard and kept smiling. Hopefully bu the time the class is over all of his illnesses will be gone and he will head home to Solo. So that is our class. We have been told that there is some romances among them but since even holding hands is not considered appropriate it is hard to tell. I will say that it is true, the couples are truly well suited for each other. It will be fun to stay in touch and see if there are some weddings in the near future. In 1997 there was financial meltdown in Asia that led to the collapse of the Indonesian economy. One of the results of this was that many large projects that were being built went into bankruptcy. 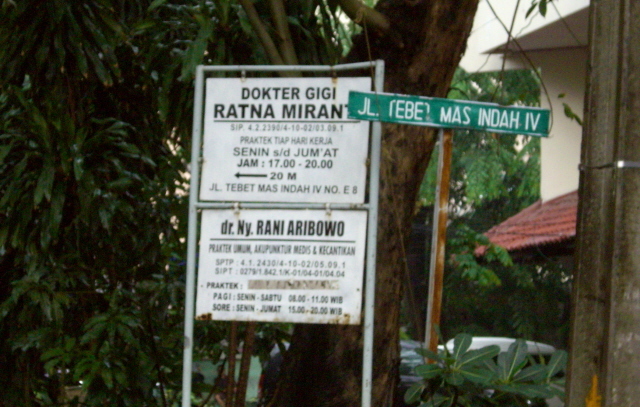 After 10 years these sit throughout Jakarta as rusting monuments to that period. This is one we drive past regularly. Another one is a huge shopping center/apartment complex that is just down the street from our apartment building. As we were getting into the car at the grocery store, I noticed this scene. 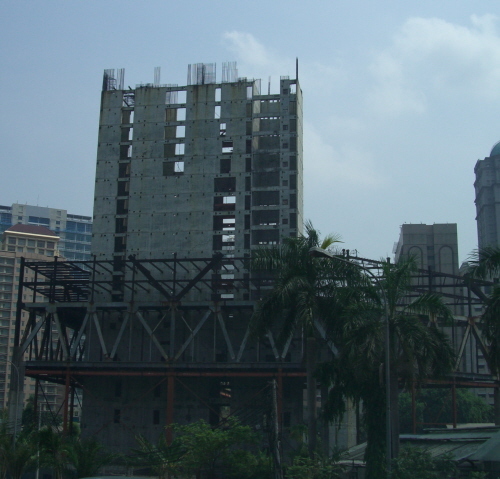 Surrounded by high rise buildings and a very modern super market, sits this old house with part of it’s roof missing. It is not an abandoned building but is obviously a home to one or a number of families. This is so Jakarta. New and old – rich and poor – just steps apart – sharing the landscape. If you have been following this blog, you are familiar with our new neighbors by the chapel. We are hoping that it will be finished before we leave Indonesia. It will be interesting to see what it is going to be and look like. 24 guitars and accessories – good thing they were not cellos. William is going to hate me for this, but it had to be shared. 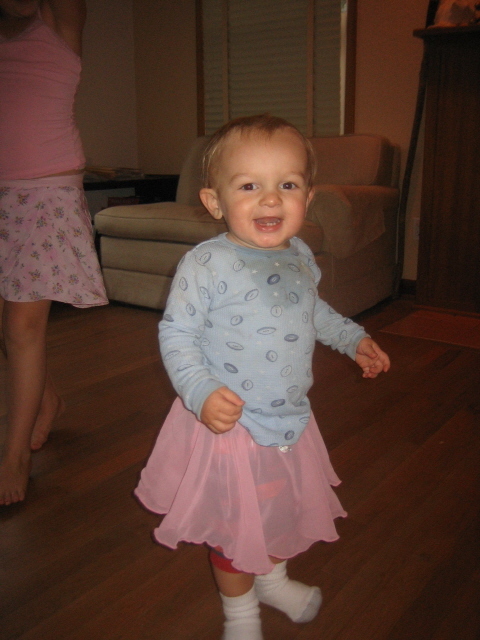 This is what happens when you leave your young son in the care of his older sister. I read from PMG before going down to exercise. The morning continue normally – we only read 2 pages from Kitab Mormon before we have to leave for class (I started to write school!) The traffic is almost back to normal. I did get a couple of good motorcycle pictures this morning. The 24 guitars moves up into my top 10 loads. Classes went well today. We split them for most of the morning class and then we had them together for the afternoon ones. I spent much of my time creating review tests, fractured sentences, and putting vocabulary sections together. I think my more advanced group is doing well. Today I caught them all nodding that they understood a concept I was teaching them. I then asked them to create some sentences using what I had been teaching and none of them could. I explained to them that it was OK not to understand but it was not OK to act like they did. I mentioned that our purpose was to help them and that we could not do that if they did not tell us when they were lost. I mentioned that I could understand what they are going through because I have been struggling with Indonesian for about a year. They know English much better than I know Indonesian. Anyway I think I got my point across and hopefully in the future they will ask questions instead of nodding their head. I also spent some time answer email from another couple and from a Korean brother who is looking for a sales representative here in Indonesia. It looks like a good opportunity but it calls for a rather specific talent and I am not sure we have any member that fits the profile. I will know more when I meet him in a week or so. Mary left early so she could be home when the cleaning woman came. I stayed and finished up the class. When it was over I caught a taxi home. It turned out that the cleaning lady did not come so Mary had time to correct some tests that she gave on Tuesday to the mission office staff. Some of them did well but some of them need lots of help. We read from the Kitab Mormon – we are in Ether just as the wars are starting. I really enjoy the first part of Ether, but I must confess I find very little spiritual food in the last 2/3. I guess I need to repent and find what is special enough about that part to make it worth preserving it for future generations. After that we had hot dogs and chili dogs for dinner – real Oscar Meyers hot dogs with Hormel Chili. It reminded me of home. I spent most of the rest of the evening working on pictures and this journal. I am going to read from PMG before heading off to bed. Following the counsel of president Eyring I look back over the day to see where the Lord has touched my life. First there is my health – something I hardly ever thank the Lord for. Only bad health seems to catch my attention. But how blessed we have been on this mission as far as health is concerned. Then there is the blessing of working with these six fine young people. Each so different and yet all untied by the gospel. I am touched that the Lord has entrusted them and their lives to us for a month. What a great responsibility and blessing. Hopefully I will be able to help them in some small way that will help them live a better life and be better leaders in the church here in Indonesia. These are just two of the blessings. As I took the time to think about this, I could feel the spirit testifying to me of the value of president Eyring’s thoughts. So another tender mercy that the Lord gives me is the inspired leadership of men called of God in these latter-days. This entry was posted in Mission - Indonesia on October 24, 2007 by Bill.